To order online, please visit NewSouth Books website here. The killing times were barely over in the Kimberley. What I knew, even as a small boy, was that no-one argued with a whitefella. People talked in whispers. I was still so small. This is the story of the early years of my life. The story of a boy who was taken away from his mother and his family forever when he was just six years old. He had no say in it. His family had no say in it. The government had all the say in everything. A memoir of boyhood by a man who was removed as a child – from country, from culture and language, from family, from his mother. ‘This is a very strong story of survival. A tragic reminder of the harshness and unfairness of the mission era but also the toughness and determination of our people.’ Bruce Pascoe. Nov-December 2018: Media Highlights of MUBA win. Ptilotus Press. 1 December 2018: ‘A memoir of the stolen generations voted most underrated book’ by Daniel Browning. Awaye! ABC Radio National. 27 November 2018: ‘A tough Kimberley tale of resistance wins most underrated book of 2018’ by Wendy Caccetta. National Indigenous Times. 23 November 2018: ‘The story of WA Stolen Generation survivor Frank Byrne wins national award’ by Phillipe Perez. CAAMA News. 22 November 2018: ‘Local memoir Living In Hope wins national award’. Alice Springs News Online. 22 November 2018: ‘Living In Hope Wins’ by Karen Wyld. Indigenous X. 22 November 2018: Media Release: Living In Hope wins Most Underrated Book Award 2018. Small Press Network. 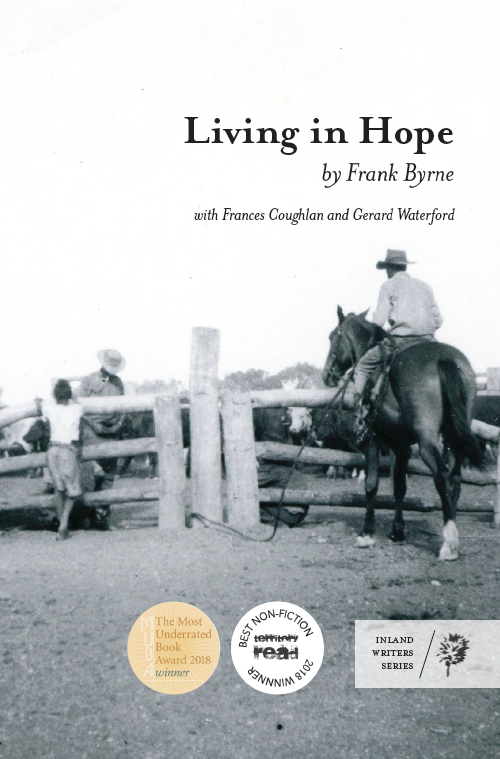 6 November 2018: MUBA18 Spotlight: ‘Living In Hope’ by Frank Byrne with Frances Coughlan and Gerard Waterford. Small Press Network. 18 October 2018: Most Underrated Book Award 2018: Shortlist Announcement. Small Press Network. 8 August 2018: ‘A memoir of finding things, not just losing them’ by Tim Rowse. Alice Springs News Online. August 2018: ‘Off the Shelf: August’ by Kate Rendell. Off The Leash. 30 July 2018: 2018 Territory Read Winners. Northern Territory Writers’ Centre. The son of a Gooniyandi woman and Irish stockman, Frank Byrne was born on Christmas Creek Station in the Kimberley on 20 July 1937. He was a child of the Stolen Generations, taken from his mother at the age of six. Frank spent the next nine years at Moola Bulla native station and Beagle Bay mission, and then, when he turned 15, began his working life as a stockman on Birrindudu Station in the Northern Territory. Frances Coughlan and Gerard Waterford are social workers and counsellors at Central Australian Aboriginal Congress in Alice Springs, and share an interest in assisting people to tell their stories of survival and courage as part of their therapeutic journey. Frank approached them in 2015 to help him finish his life story. Their work began with a three-week road trip through the Kimberley, retracing Frank’s childhood steps, and meeting with family, friends and fellow Stolen Generations survivors. Sadly, Frank was diagnosed with cancer shortly after returning from the Kimberley trip. Despite his illness, he continued to work on his book, and he and his writing team completed a full manuscript of his life story shortly before he died. This book, Living in Hope, is an extract of childhood memories from Frank’s full memoir. It was first launched in Alice Springs among his family and friends in May 2017. Later that year, he returned to his country in the Kimberley where he died on 20 October 2017. Frank Byrne is buried beside his mother Maudie Yoorungul in the family graveyard outside Fitzroy Crossing. To mark the 2018 anniversary of Frank’s death, Ptilotus Press compiled a series of photos and memories in honour of his life and story. Click here to read more.